In the school of thought, there are two areas that are often compared and contrasted: the conscious and the subconscious. The former is what we are aware of, the actions we take that we knowingly carry out, whereas the latter is what happens “without our knowledge,” the actions we take that we unknowingly carry out. We often say that “I subconsciously did this” in response to doing something that we are unable to explain. But what is interesting is that we accept this “hidden” part of ourselves. That is, despite having a main and understood self, we still believe there is a second, similar self within us. 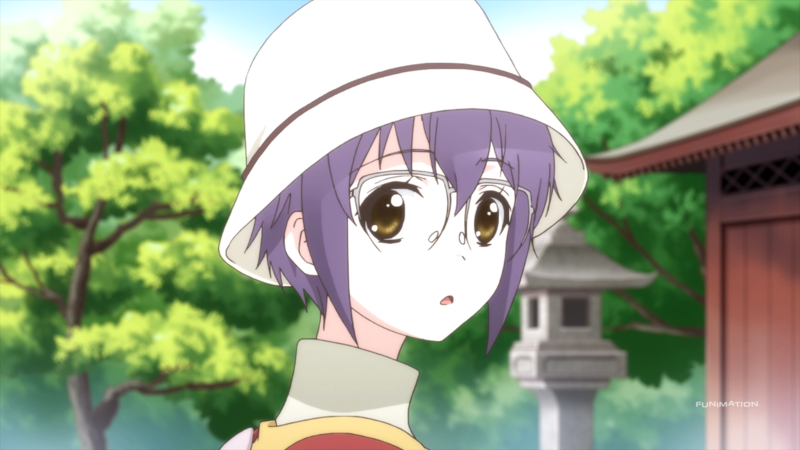 The Disappearance of Nagato Yuki-chan is connected to this notion of two selves, generating an anime that somewhat subconsciously loses itself along the way. Something that not everyone learns is the notion of perspective. Having the ability to displace one’s self, move outside of one’s current view and look at a particular situation from a different vantage point, is valuable not only for the one shifting his or her perspective – since it reveals previously unknown ideas – but also for those being looked at differently – complete bias gives way to further understanding. The Disappearance of Nagato Yuki-chan targets this same theme with mixed results. The anime’s sign that its overall perspective is about perspective is in the way that it structures its narrative, and more specifically who is doing the narrating. Essentially, the plot shifts its perspective between three separate characters throughout the season: the regular Nagato, the “new” Nagato, and finally Kyon. The majority of the anime follows regular Nagato (about the first ten episodes or so), with her segment more slice-of-life and romantic-comedy in nature. One moment she is sharing a drink with her crush while the next has her on vacation with all of her friends to enjoy life’s small offerings. During her events, the anime is generally fun, upbeat, and lighthearted, as a simple foray into the Haruhi Suzumiya world that this spinoff comes from. Feelings of this kind are felt because the audience is viewing the anime from Nagato’s perspective which coincidentally has these same emotions. Therefore the viewer comes to understand Nagato’s thoughts directly from her, laying down the foundation for how the remainder of the season proceeds. However, the emotions subsequently change when the perspective does, most notably when the show moves from regular Nagato’s point of view to new Nagato’s. No longer are the feelings related to elation but instead loneliness, depression, and sadness because that is how new Nagato perceives the environment around her. As a result, the anime also goes from being slice-of-life oriented to being dramatic in its presentation. Gone are the small talk and romps, replaced instead with trips to quiet libraries and nighttime park benches that encapsulate the plot’s new focus. Haruhi’s exclusion during this arc makes the switch even more apparent – the biggest ball of energy is purposefully missing to keep the show’s current tone bogged down. Such a tonal shift contrasts harshly with the beginning, giving it higher impact on the viewer and therefore higher power since the effects are both immediate and palpable. But even more powerful is how the change in perspective allows for the audience, for the first time, to see regular Nagato from a new angle. Before it had always been through her eyes, through her own introspection. Now, she is seen from a point that is paradoxically inside and outside of herself due to new Nagato’s special status. Consequently, the narrative showcases regular Nagato’s thoughts and feelings through new Nagato, providing (coincidentally) a new angle to view the characters in question and thus the relationships involved. For its final angle, the anime changes its perspective to Kyon, the character who has been the target of the girls’ affections the entire time. 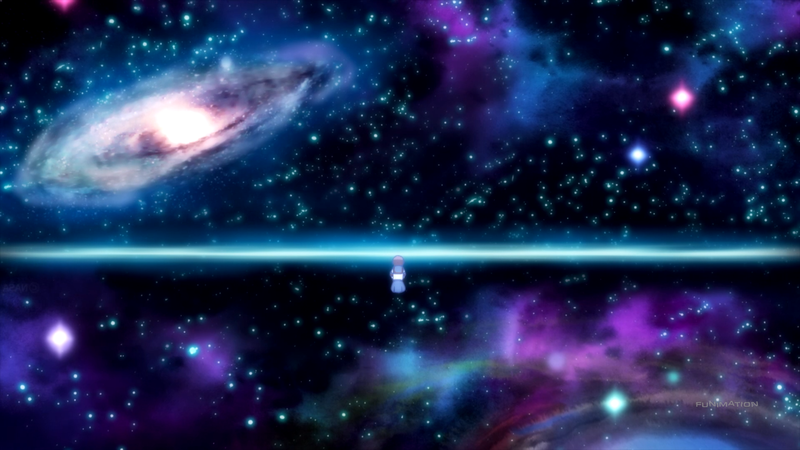 Like new Nagato, the change in perspective can be seen in the reassembly of the anime’s elements: Kyon’s little sister is around more than ever, evident references to “Endless Eight” are included, and his previous connection to Haruhi is elaborated on. Perhaps obviously, the trend of morphing feelings continues, with this last iteration mirroring Kyon’s awkwardness and unsureness. Again, these emotions are present not only because of the conflicting personalities and actions between the regular and new Nagato but also because the narrative is now from his point of view. This results in a similar investigation of the characters and relationships; the audience is now able to see both Nagatos from a perspective that is completely separate from them. Kyon wrestles with himself on what to do, he interacts with the characters in more meaningful ways – less joking and more personal – and his ultimate decision reflects the sort of middle ground that was necessary to succinctly conclude the problem at hand. The anime certainly could have flipped its perspective back to the regular Nagato but that would have reduced Kyon’s plight and would not have meshed well with the newfound mood since regular Nagato was always about having a happy time. But no matter how elated or melancholy the narrative gets, that does not immediately reveal what this perspective-shifting creates. 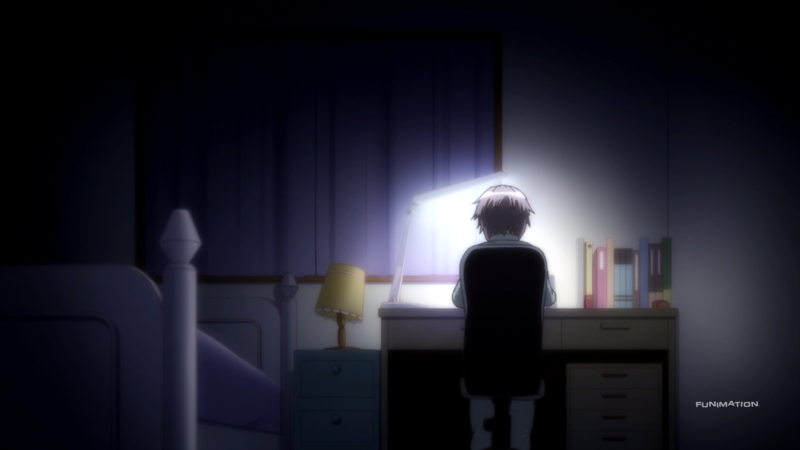 In the case of The Disappearance of Nagato Yuki-chan there is good news and bad news. The good news is that the constant shifts in perspective allow the anime to escape from self-imposed narrow-mindedness. The situation between Nagato and Kyon is not relayed through a singular outlet but many outlets, altogether crafting a dynamic, rounded, and interesting tale that is open and explored since the multitude of perspectives prevents the anime from restricting its mindset. Since each main player’s direction is elaborated on, the narrative is empowered because it is no longer streamlined and instead given the opportunity to reach the same destination – a satisfying resolution between the three characters – but from multiple paths at once. Unfortunately the bad news is hefty and almost ruins the narrative entirely. In essence and inherently, the tactic of shifting perspectives has a major problem: losing itself along the way. Initially the anime is about regular Nagato’s feelings toward Kyon but by the end it is about Kyon’s feelings toward new Nagato. In other words, the show’s original goals are never accomplished because the change in perspective brings with it a change in the conclusion. Using the multiple paths analogy once more, while the destination is reached, the anime chose to not look back or at least place markers along the roads it took. The implication, then, is that when the finale is over and it does see where it came from, it has no idea how it got to where it is at because there are too many paths to choose from without any sort of indication for which were taken when. Putting it differently, the conclusion makes it clear just how lost the anime is. When done right – which happens here – shifting the perspective illuminates new ways in which to view the narrative. When done wrong – which happens here – shifting the perspective conceals how the narrative got from start to finish. Collectively, the mixed concoction is neither wanted nor discarded but simply tolerated. 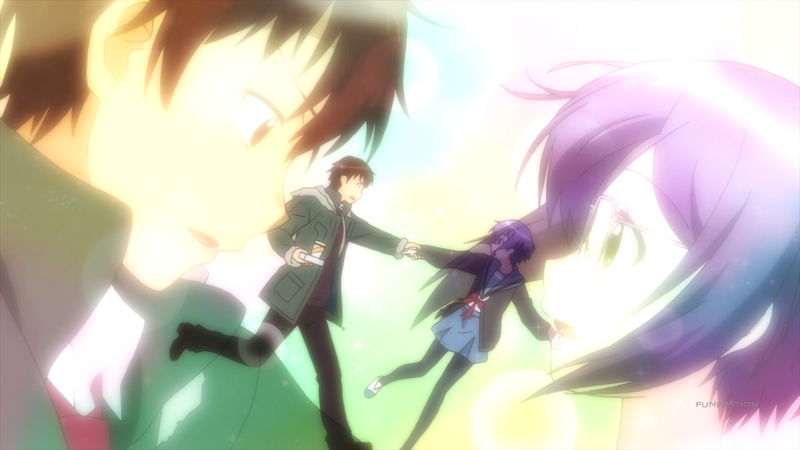 The Disappearance of Nagato Yuki-chan chooses to employ a soft art style. Both the backgrounds and the character designs adopt this look as a means to make the anime more inviting; like a kind person, a show that is shown to be “caring” is easier to approach. Along these same lines, the locations visited are familiar to both newcomers and veterans of the series. The clubroom, the school grounds, the library, Nagato’s apartment, and the various areas within the city are visited, giving the anime a new yet nostalgic feel that further adds to the invitingness. Simultaneously, the show often makes use of a “chibi” art style, where characters and their faces become squatter and more exaggerated than normal to emphasize the comedy of the situation. It is also worth highlighting the anime’s expert representation of new Nagato’s perspective. 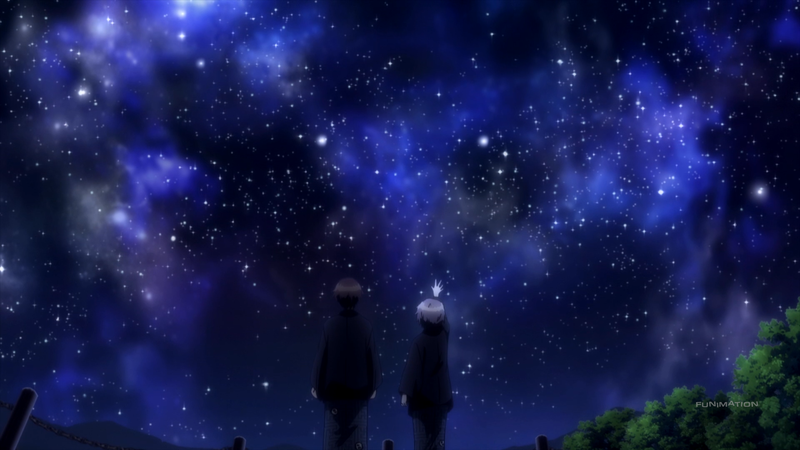 Where regular Nagato and Kyon have bright lighting and colors, new Nagato’s arc is mired in darkness, with low lighting and more somber hues – mainly purples, blacks, and blues – that work together to make her perspective that much more sad. The characters’ designs are actually rather plain, mostly as a result of the soft art style. 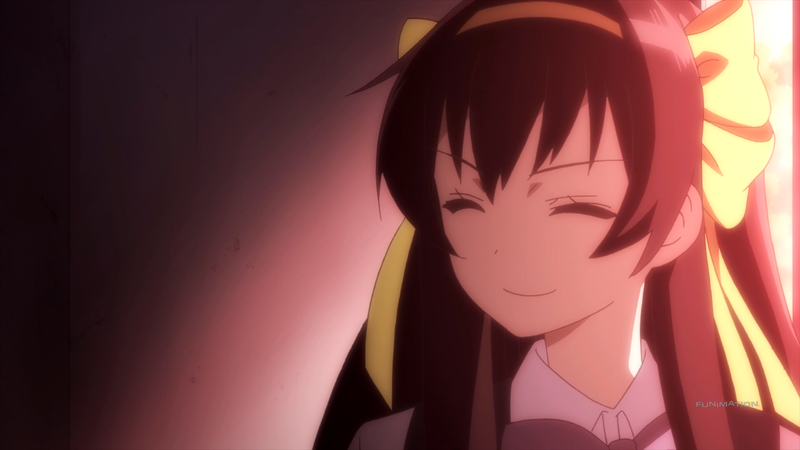 Besides Haruhi’s yellow ribbons and long, brown hair, the remainder of the designs all sort of blend together. The boring school uniforms, the weird hair colors, and the lack of extra detail (accessories or similar additions) keep the characters grounded in realism at the expense of interesting or memorable designs. Granted, the characters do fit their roles: Asahina’s peach hair coincides with her girly behavior, Asakura’s long blue hair and mature face matches her motherly instincts, and Yuki’s short, purple hair and round glasses fit her shy attitude, to name a few examples. Meaning, the character designs, while uninspired, manage to be purposeful within the context of the anime. Actual animation tends to sit somewhere in the average area due to the laidback dealings of the anime. In general, the show is never flashy or dull, instead showcasing the everyday dealings of high school teenagers. Characters interact with each other using typical body and facial movements, with a lot of the downtime regulated to them standing or sitting around having a conversation about themselves, each other, or the occurrence at hand. The Disappearance of Nagato Yuki-chan’s approach to its characters is two-fold in more ways than one. On the surface, the characters embody a smorgasbord of personalities. Nagato is the clumsy girl, Kyon is the wisecracker, Asakura is the competitor, Haruhi is the hyperactive one, Koizumi is the quiet sage, and so on. The anime portrays them as such because that is who they are; of course, how could they be anybody else? Interestingly, besides Nagato’s increased reactions and Asakura’s more prominent role, the characters act much like they have been known to behave. That is to say, the traits that have defined them in the past – within the original series – have carried over into their present manifestations, providing the same sense of nostalgia that the art did. Indeed, people experience development over the course of their life but who they are and how they act is something that is persistent. Someone who is a partier remains a partier, someone who is a nerd remains a nerd. So, the cast of the show are the same: Nagato usually fumbles with common happenings, Kyon has a witty comment or two to share, and Haruhi is the one that designs the ridiculous activities. Characterizations like these are not just readily perceivable but also immediately attributable based on what the viewer learns and possibly has learned. It is not that the partier cannot become the nerd and vice versa, but that people who portray themselves one way rarely lose that side of himself or herself. Geometrically, features are lines that connect a definition to the person in question. When someone is described as funny, that word strings the ideas of funniness with the one being described – he or she tells jokes, makes weird faces, uses overzealous motions, and so on. The same train of thought applies to the cast; calling Kyon sarcastic or Haruhi rambunctious causes the brain to start making connections. But people are not one line, but many. Continuing to think with geometry, people are shapes, complex structures that weave and loop in intricate patterns. People are made up of a large amount of lines at once that, collectively, make someone who they are. In other words, people do not have just one side but several; people are multiple “persons” at once. The Disappearance of Nagato Yuki-chan showcases this mathematical premise with each of its characters. Kyon’s wittiness and outward smartness sits alongside the worrywart and kind person that he is. Asakura might be a competitor at heart, but she is extremely motherly, treating Nagato like her own child. Haruhi is selfish and slightly crazy but she can be envious and sane when she wants to be. Even Koizumi, in all his infinite wisdom, would much rather flow like water, be a follower instead of the leader he seems destined for. Now, the majority of these are contradictions, where each person’s “second person” goes against their regular self, but this pronounces the type of shapeshifting people experience. People can, and often are, polar opposites of themselves, both because they are allowed to be and because it is simply another side to the shape. A potential problem arises when the most important character, Nagato Yuki, is used in conjunction with this line of thinking. As is shown, the anime depicts the regular and the new Nagato as different people entirely. Not the same person with two distinct halves but rather two distinct people. That is, it appears as if the Nagatos do not follow this train of thought since the anime goes out of its way to say, “This is one Nagato and this is another,” that it is not one Nagato with multiple sides but instead two separate women. But they do. Regular Nagato is surely shy but hidden beneath her hiding exterior is a girl looking for and wanting love. New Nagato is a bit more reserved yet sure of herself. While she was not looking for love, it found her, with the understanding she had of her person encouraging her to press on where the other Nagato never could. The Nagatos being two separate people, with their own set of traits, features, and quirks that make them composed of several “people,” is ultimately the anime’s message: a person is composed of a mishmash of shapes that make him or her a completely unique one. In a way, the show is alluding to the original series, with its characters having identities separate of their “normal” selves that made them special individuals. Kyon’s final talk goes down the way it does because he understands this notion, how people are made up of multiple facets that make them who they are, make them stand-out from everyone else. He sees that it was not the regular Nagato he started to have feelings for but the new Nagato, with her books, quietness, and confidence that allured him. It was new Nagato’s shape, not regular Nagato’s, that seemed so appealing. Kyon’s words do not have romance flourish between any of the couplings, but it highlights the importance of differentiation. Differentiating not only between people but also between ourselves. As it stands, the entire cast lacks major development despite the drama instilled, which would seem to hamper their execution. However, due the characters’ theme on multiplicity being as involved as it is, their purpose is not entirely folded into nothingness. The opening theme is very ecstatic, which is strange since this is an anime about Nagato and not an anime about Haruhi. Regardless, the upbeat nature of the piece comes from the quickness, multiple vocalists, and weird instrumental effects that make the track itself pretty crazy. A little too crazy, given the content of the anime during the latter portions of the series. It can be fun to listen to at times but is mostly forgettable. The ending theme is the opposite, in tempo, emotion, and memorability. The vocalist gives a strong performance, the sentimental tone is serene, and the backup choir supports the main singer well. It is a track filled with loneliness, longing, and love, each of which can be easily felt when listening to it both when and when not watching the anime. The remainder of the soundtrack is two-fold like the characters. Since half of The Disappearance of Nagato Yuki-chan is a comedy, many of the tracks are similarly fun, with beach-like tunes, acoustic sounds, and faster beats to fit the occasion. The other half is dramatic, with accompanying flutes, pianos, and violins taking up much of the music. The dramatic pieces are better than the comedic ones mainly as a result of the passion they exude when compared to their silly brethren. Overall, the OST is a nice group of songs that are neither strong nor weak, used when needed but lacking power. Voice acting for the show is somewhere above average. Many of the voice actors and actresses reprise their roles, such as Minori Chihara as Nagato, Tomokazu Sugita as Kyon, and Aya Hirano as Haruhi. Minori Chihara in particular gave a wonderful performance, providing a voice that is awkward, quiet, and straining, portraying Nagato as the pitiable yet hopeful lead. Alongside Tomokazu Sugita’s sarcastic and overly-manly voice for Kyon, Aya Hirano’s peppiness for Haruhi, and the remainder of the men and women giving nice performances, the cast as a whole gave the show some much-needed life. I would not consider myself a fanatic (aka, a fan) when it comes to the Haruhi series. I think it is well-done – and yes that does include the second season that seems to literally define repetition – but I never find myself talking about the series to someone else or even suggesting it. Again, not that I hate the series or find it missing in execution, which are both untrue, it is simply always sitting somewhere slightly outside of my mind. The movie which, coincidentally enough, shares nearly the exact same name as this series, is a whole different beast that should be viewed by everyone. That being said, as I was watching this one, I found myself liking it. It was because of the romance aspect; watching Nagato squirm, stutter, and smile her way towards the love she wanted was cute to watch, as was all of the blushing and courage she sporadically had. The references to the original were cool throwbacks, too. They were used sparingly and appropriately: not too much so that it became indistinguishable from the original series and not too little so that it forgot its origins. Comedy-wise, the show also had a foothold, with reaction faces, character interactions, and skits that would usually get a laugh out of me now and again. But as the anime began switching its perspective, so did I. I started to find the show less and less entertaining the further along it progressed. New Nagato’s segment is arguably the strongest part of the anime, but it was a section that was honestly quite boring. I wanted Nagato to continue fighting for Kyon’s attention. I wanted Kyon and Haruhi’s personalities to still be around. I wanted Asakura’s overprotection. I wanted the fun, the romance, back. But I did not get what I wanted. What I got was a show that was not what it was before, making me, like Nagato, longing for that which I could not have. For a final note, I want to say that, despite Minori Chihara’s amazing performance, I hated Nagato’s voice. Nagato acted cute but spoke in a way that was unfavorable. It was not deafening or unbearable, but it was grating and annoying. Each time she started to speak, I was wondering when she would stop because it sounded like she was struggling, drowning in a sea of her own vocal chords. To be fair, that is sort of the point – she is a super-shy girl that has difficulty socializing with others – but that did not prevent me from disliking her each time she opened her mouth. The Disappearance of Nagato Yuki-chan is an anime that has surprisingly strong themes on perspective and variability of the self, with mediocrity within its remaining parts unfortunately covering them. The story gets lost in some woods, the characters’ development gets misplaced in a cabin, and the music gets abandoned on a mountainside, each with zero chance of recovery since the show never attempts to find them. At the minimum, the anime, like its lost items, will continue to exist in the subconscious of those that have seen it: always there but not quite remembered.